Lastly add jeera,chopped coconut ,ginger chillie paste,mix well. If you want it very soft,keep aside for half an hour,and if you want the shape to be round add maida flour a bit. But if you want a little crispy add rice flour more. 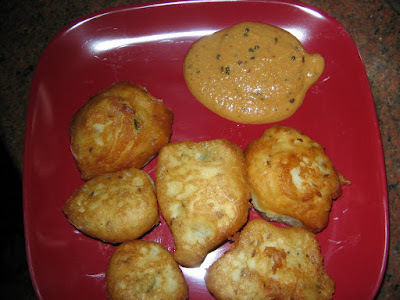 Then place a kadai for heating the oil on a stove.Then after the oil is heated then make medium round balls with watery wet hand and place vadas in the oil. Cook in med to low flame,till the bondas are fried and they turn brown. Serve hot with chutneys.Children opt this dish much. Source:Tv programme of cooking .